When Ethan Berkowitz was first elected Mayor, the Anchorage Police Department was woefully understaffed with the number of police officers heading into the low 300’s. According to the Police Executive Research Forum (PERF) Report which was first published in 2010, and later updated in 2016, for a city the size of Anchorage this number of officers was not sufficient. Since taking office in 2015, Mayor Berkowitz and the leadership of APD have run 6 police academies with the goal of raising and maintaining the number of police officers to over 400, which they accomplished. For the last 3 consecutive academies, I have personally coordinated a youth engagement activity during the cadets’ “Community Day” at the Mt View Boys & Girls club, which is home to over 200+ kids daily. “Community days” happen the day before police academy graduation and provide the opportunity to decrease the social distance between new officers and community members which helps to break negative stereotypes and build trust. 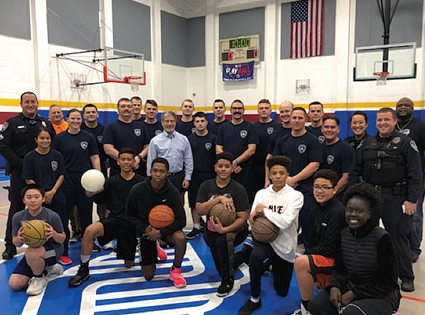 These interactions also provide a positive opportunity to expose the young people of Mt View to careers in law enforcement as the department seeks to recruit diverse candidates for its next academies. Although diversity is lagging in their recruitment numbers, APD has proactively sought to extend the reach of their recruitment net with the intent of having a force that reflects the diversity of Anchorage. However, without strong community support, it is often difficult to recruit an adequate number of diverse applicants in the first place. In other words, the community has an opportunity to help shape the composition of the department through collaborative outreach and recruitment. Plus, with a salary range of $69,908.80 - $93,787.20 annually, it is a really good job! The Anchorage Police Department is hiring now for its June 2019 Officer Academy.